SCVHistory.com LW3489 | William S. Hart | Letter: Royalties Received for ''Pinto Ben'' Sound Recording, 1929. 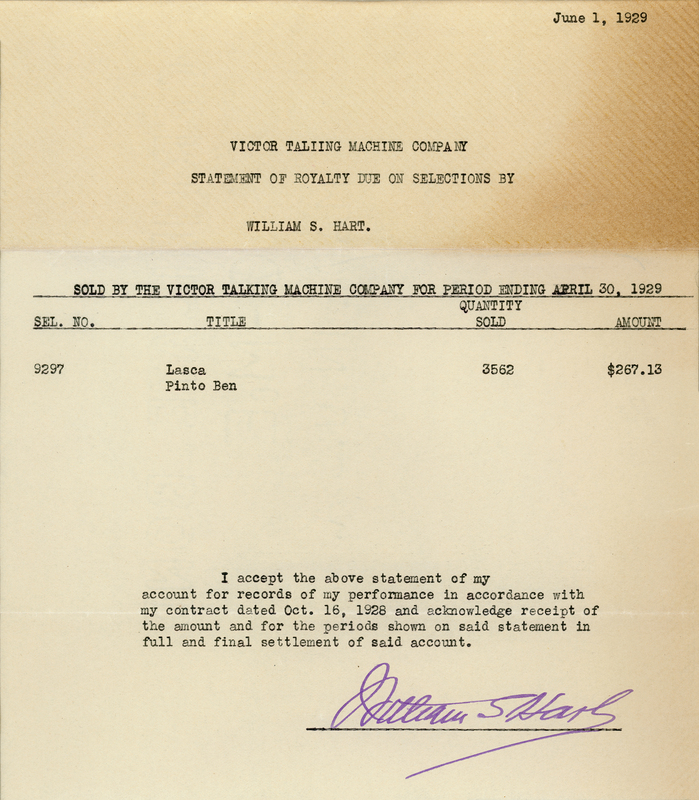 William S. Hart acknowledges receipt of "payment in full" of royalties from the Victor Talking Machine Company for his sound recordings of his own poem, "Pinto Ben" (on the "B" side), and Frank Desprez's "Lasca" ("A" side). Dated June 1, 1929, the letter shows 3,562 records were sold between October 18, 1928, when the recording was made in Camden, New Jersey, and April 30, 1929. Hart was paid royalties totaling $267.13, which works out to 13&frac13; cents per unit. I accept the above statement of my account for records of my performance in accordance with my contract dated Oct. 16, 1928 and acknowledge reciept of the amount and for the periods shown on said statement in full and final settlement of said account. Certificate Bond paper, "C-McE" process (finished on both sides for typing or printing), 8½x9 inches, trifolded for mailing in a standard No. 10 envelope. The letter probably measured 8½x11 inches before it was cut and glued onto a mat and framed by a collector. Hear the "B" side ("Pinto Ben") and read more about it here. LW3489: 9600 dpi jpeg from original letter purchased 2019 by Leon Worden. Filed in large files.